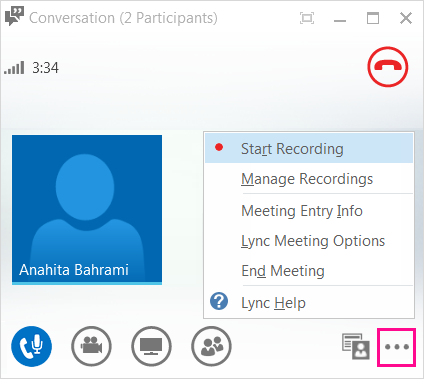 When you record a Lync Meeting, you capture audio, video, instant messaging (IM), screen sharing, PowerPoint slides, whiteboard, and polling. Any of the presenters can record a meeting and save it on their computers. To learn about Lync Meeting room features, including your options for audio, video, presentations, participants, and layouts, see Introduction to Lync Meeting room or Details about the meeting room for Office 365 users. Click More Options > Start Recording. If the recording option is dimmed, your audio might not be connected. Click the mic/phone icon to connect audio, then try again. Lync automatically saves the recording in MP4 format that plays in Windows Media Player and Zune. When your recording has been processed, you can access it to play or send to others. Lync displays a message when the recording is ready. You can click the alert to open Recording Manager, or if you miss that, click Tools on the Lync main window, then Recording Manager. Tip: Recordings are saved in the Videos/Lync Recordings folder on your computer. For more information, see Lync recording manager.